I don't know if it's been posted here before, but I think it's great news. Great News indeed. Thanks for providing this. That explains why they have been out of stock for so long then. They wanted to sell the improved one. Will it stand a rider with higher weight than 85 kg then? Or does the bike just get longer life with the 80 kg owners? Good that they listen to advice from customers. The good news is also that the first batch of A-bikes must have proved sufficiently profitable to bother producing an improved version. That means the A-bike will not sink without a trace like most Sinclair products have since the days of the Z88 computer. A guy here in Sweden found a good replacement for the seat, as others has done too. He find it much easier now to use the A-bike when he has a seat with much more comfort. It is a "foldable" seat. Make the bike just a tad bigger when folded. I'm surprised he hasn't told us about it. But he is very buisy with his work. Hey Weakling. How is the Swedish seat comparing with mine (a Taiwan seat)? Jon, here is my answer. I found a good thread to put it in. to find cause I don't even know the Swedish words he used. Does the brand Velo sounds familiar. As I get him he used standard parts. the thread don't find what they look for so me try to start a new one. Here is the flash file of the announcement. I've captured the text from it. I think that is very good news. Especially the part about freewheel because I do not trust in long live this a-bike component. After further conversation with the factory, A-Bike Mark II will not be available so soon. We will keep you informed. Thank you for your support. Last edited by Amuro Lee on Mon Mar 10, 2008 4:58 pm, edited 1 time in total. freewheel, alminium tubing, seat, ah all the things we wanted to be improved!! I hope it come out before summer. Is there any information on new gears? Now, if pedaling rate is one turn per second (the most comfortable pace for me personally) the a-bake gears provide 11.7km/hr. Total gears rate is 6,8 and one circle of pedaling moves the bike in 3256 mm travel lengh. With this pedaling rate I feel no any resistance from pedals (on flat terrain profile). Therefore, I think, the optimal gears rate must be not less then 9,0-9,5 for 6'' wheels. Sure, length of cranks should be increased up to the standad size. alexko wrote: Is there any information on new gears? Now, if pedaling rate is one turn per second (the most comfortable pace for me personally) the a-bake gears provide 11.7km/hr. Total gears rate is 6,8 and one circle of pedaling moves the bike in 3256 mm travel lengh. With this pedaling rate I feel no any resistance from pedals (on flat terrain profile). Therefore, I think, the optimal gears rate must be not less then 9,0-9,5 for 6'' wheels. Sure, length of cranks should be increased up to the standad size. I haven't heard anything on the gear of Mk-II, but i suspect the gear ratio will stay the same. I did quastion the A-bike designer about the gear ratio, and her said that it was intentional to make the gear ratio as light as it is now. I know this sounds silly, but I guess A-bike team cannot really take chances as manufacturer --- their A-bike is not full-metal bike in the end of the day, you know. Personally I'd love to have heavier gear on my A-bike, but I haven't really got time to work on the 15T gear project right now. so my bet is that Mk-II will be structurely enhanced, but not functionaly. Having broken 2 of them, structural enhancement will make it more functional. hahaha, yes, that's quite right. Having total of three rear frame tubes cracked, I personally welcome strengthened aluminium tubing the most welcome. 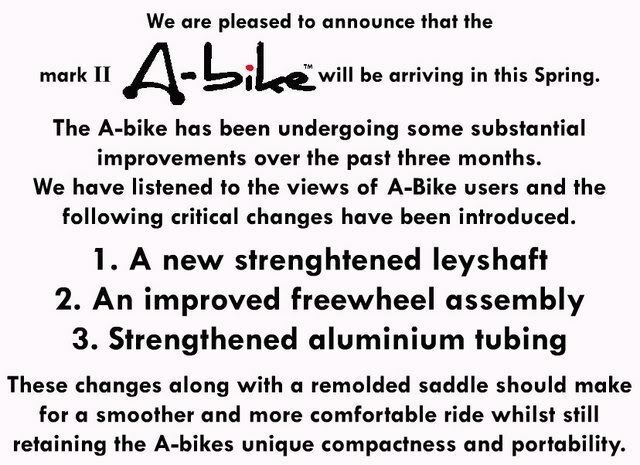 I hope the strengthen parts canbe installed to the original A-bike too, something like 'upgrade kit'?